Dr. Birmingham is Professor of Medicine, University of British Columbia, Vancouver, BC. Dr. Jones is Professor of Dietetics and Nutrition, McGill University, Montreal, Que. An active, middle-aged salesperson in a large department store, who plays tennis and walks to work, consults her primary care physician about her resistant obesity. Although the patient was slender in her earlier years, over the past decade her weight has gradually increased by 10 kg. Despite having carefully followed a weight reduction diet, the patient's weight has remained constant over the past 2 months. The patient, who is an intelligent, motivated person, produces several pages on which she has detailed the food she eats every day. This clearly documents her close adherence to the weight reduction diet that she was prescribed. Why can't she lose weight? Physicians are frequently confronted with obese and overweight patients who do not lose weight, despite insisting that they are following their prescribed diets. Patients often maintain that they must have an abnormally low metabolic rate. Physicians may investigate for hypothyroidism. However, the real reason underlying this paradox is that the current methods for assessing energy intake are flawed, and they underestimate actual energy intake. In this paper, we review new methods for measuring the energy content of foods and address the problem of energy expenditure in obese people. We hope that by understanding these components of obesity, physicians may be better able to manage their obese patients and to advise dietitians and nutritionists. This paper does not address the broader issue of the clinical management of obesity, a topic covered in an upcoming paper in the series. Regardless of the reasons for the growing obesity problem in developed societies, a consistent metabolic underpinning is that weight gain is caused by an imbalance between energy intake and expenditure. Any individual of any weight who is maintaining that weight is by definition consuming just enough energy to balance the kilojoules expended as energy. Thus, if a person claims to be dieting but is not losing weight, then he or she is still eating too much. Overweight occurs when there is continually greater energy intake than energy expenditure; weight loss occurs in the opposite situation. The level of energy expenditure itself is sensitive to a number of factors that vary through the life cycle. Factors including growth rate, basal metabolism, physical activity, age, menopause and certain disease states can modulate energy expenditure substantially. It is important to recognize that, in some instances, weight may vary for reasons not related to energy, including fluid loss and retention; however, in most cases, if the energy intake is not adjusted in line with shifts in energy expenditure, then energy and weight imbalances follow suit. A goal for nutritionists when assessing an overweight individual is to determine an ideal weight loss diet for them. To do this, nutritionists will want to recommend a diet containing fewer kilojoules than the estimated expenditure. In doing so, nutritionists will consult existing guidelines. Government and other health agencies now publish guidelines that Canadians can follow to select an optimum diet. But these guidelines may be begging a fundamental question: How much food is too much, and how much is enough? Guidelines for food intake in Canada are provided by the Canada Food Guide,6 which contains recommended energy intakes based on Health Canada Recommended Nutrient Intakes (RNIs). Specific population subgroups, such as elderly people, are provided with individual recommendations as to what constitutes a prudent level of food intake consistent with good health. Unfortunately, the existing values contained in these guidelines are out of date. The guidelines were not drawn up using modern methods for measuring energy intake and thus they provide estimates of energy requirement that are erroneously low. Four methods have been used by scientists to determine energy expenditure, and thus requirement, for weight balance. The first is estimation of food intake as a proxy for energy expenditure. The second approach has been to use tables that predict basal metabolic rate, with the addition of an estimate for additional kilojoules expended for physical activity and for the normal digestion of foods. Third, measures of oxygen consumption have been used for subjects in contained living environments, such as a calorimetry chamber. Last, the doubly labelled water (DLW) method has been used to measure integrative whole body energy expenditure in free-living, normal life situations (see Appendix 17,8,9,10 and Fig. 1 for methodological details). Fig. 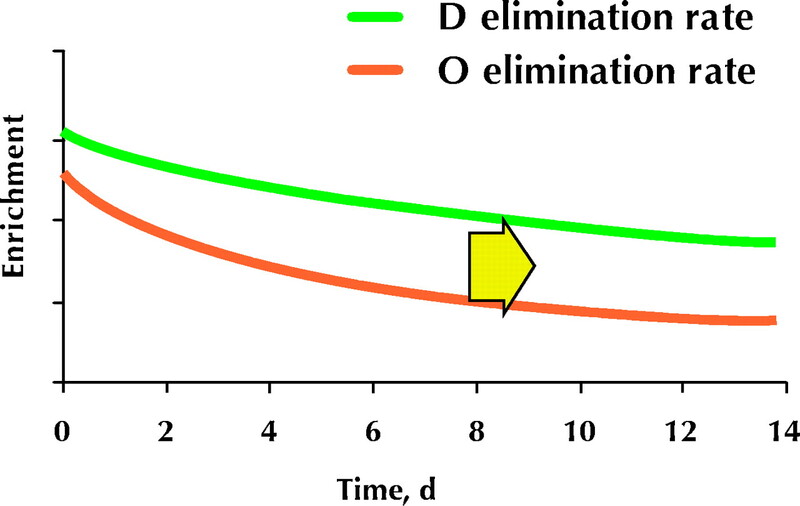 1: Doubly labelled water method: on day 0, human subjects drink water that is labelled with the stable oxygen isotope 18 O (red line) and the stable hydrogen isotope deuterium (D) (green line). Most of the oxygen is converted metabolically to carbon dioxide and eliminated through the lungs. The remaining oxygen is eliminated as water, the amount of which is estimated using the labelled hydrogen. The exact rate of oxygen loss that can be assigned to carbon dioxide production (the metabolic rate) is calculated as the oxygen elimination rate minus the hydrogen elimination rate, with correction for the pool size of each isotope (see Appendix 1 for details). Underestimation of reported food intake has also been suggested by approaches other than DLW. In one study, free-living volunteers were trained to record their food intake, then they were fed fixed diets of conventional foods of known energy content that were provided at levels to keep their body weight constant for at least 45 days. The volunteers' reported measures of food intake were compared with the actual amount needed to maintain their weight. The results showed that the volunteers had been underreporting their energy intake by about 18%.20 The results of such studies emphasize that underreporting of energy consumed occurs commonly, if not invariably, when dietary intake assessment instruments are used. We therefore need to use extreme caution in relying on results from these approaches when extrapolating estimates of energy requirement from these indicators. Indeed, Canadian RNI values have been found to be low for both middle-aged and older subgroups of Canadians. The extent of this underestimate ranges from 15% to 30% depending on the age group.21,22 In the United States, it is also highly likely that existing energy requirements set as Recommended Dietary Allowances (RDAs) substantially underestimate true levels of need.23 Furthermore, it is obvious when contrasting RNI with RDA values that the RDA recommends a higher energy requirement for older women. In general, whereas levels of requirement in North America for middle-aged women are set at about 2000–2100 kcal/day (8400–8800 kJ/day), actual levels of need are in the range of 2300–2400 kcal/day (9600–10 000 kJ/day).11,12,24 The extent of this discrepancy is similar to the difference between reported levels of food intake and those actually measured using DLW. Thus, it is evident that the methods that are currently used to determine energy expenditure should be adjusted upward and that physicians and nutritionists, faced with a patient who is not losing weight on a diet that contains fewer kilojoules than estimated energy expenditure, can confidently assume that the patient is underestimating food intake. Thus, there are biases in the current methods of estimation of both energy intake and energy expenditure. These biases can create a paradox for both patients and physicians who are confronting obesity that is resistant to diet (Fig. 2). It is clear that Canadian guidelines for recommending energy intake are inaccurate. How can we improve these guidelines and how do we provide recommendations to nutrition professionals and primary care physicians? To provide a better estimate of energy needs, the RNIs should be revised using DLW methodology specific to various populations including subgroups such as young athletes and individuals with type 2 diabetes mellitus. In the interim, energy intake should be individualized based on observation, using longitudinal measurements of outcomes such as BMI, blood lipids and waist circumference. Weight loss should serve as the most reliable marker of energy imbalance; if the patient is not losing weight on a prescribed dietary regimen, the health professional must mandate further reductions in food intake, or increases in energy expended in activity. Given our new understanding of the pitfalls of measuring energy balance, it is no longer surprising that the patient has maintained her body weight. Indeed, the fact that she has maintained her body weight is proof that her energy intake has kept pace with her output. If her physician was to estimate her energy expenditure by measuring her resting energy expenditure and then adding an activity factor, or by measuring her total energy expenditure using DLW, she or he could even tell the patient how much she really is eating. But this situation is not the patient's fault! 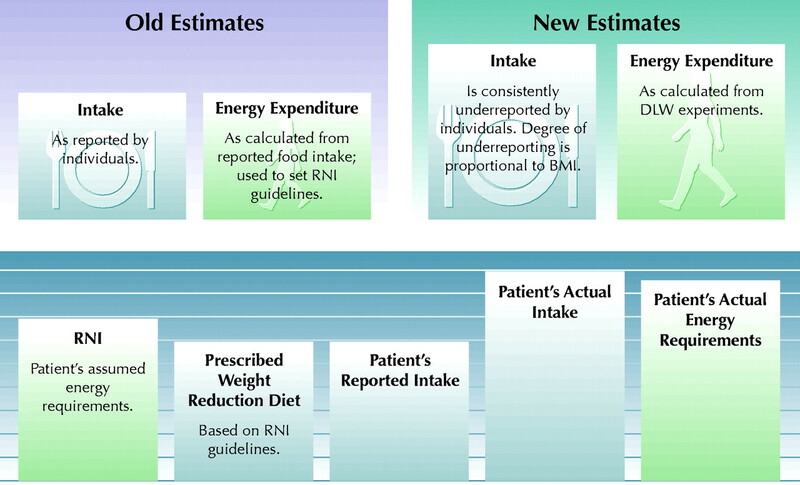 The bottom line seems to be that when patients follow prescribed diets, it can generally be assumed that their true intake is substantially greater than that prescribed, and is not accurately captured by food intake assessment instruments. The reason why food intake assessments are so unreliable is unresolved, and a matter of considerable interest. In the present case, if the physician refers the patient to her local nutritionist, will that individual know about the problems with reported food intake instruments and interpret the patient's diet records accordingly? Perhaps the patient should be advised to see the nutritionist once because of the problem with intake reporting, however, the key end point will be weight loss and not the supposed level of compliance with any prescribed diet. Thus, the extent of weight loss together with perhaps other risk markers, such as lipid levels and glucose tolerance, become the primary end points for assessment of the efficacy of the dieting strategy. Whatever the explanation, there can be no doubt, based on our current understanding, that obese people underestimate their energy intake. Hoffer LJ. Clinical nutrition: 1. Protein–energy malnutrition in the inpatient. CMAJ 2001;165(10):1345-9. Atkinson SA, Ward WE. Clinical nutrition: 2. The role of nutrition in the prevention and treatment of adult osteoporosis. CMAJ 2001;165(11):1511-4. Young SN. Clinical nutrition: 3. The fuzzy boundary between nutrition and psychopharmacology. CMAJ 2002; 166(2):205-9. Holub BJ. Clinical nutrition: 4. Omega-3 fatty acids in cardiovascular care. CMAJ 2002;166(5):608-15. Contributors: Dr. Jones did the research for this article and the initial drafting of the manuscript. Dr. Birmingham contributed to the writing and revising of the manuscript. Calle EE, Thun MJ, Petrelli JM, Rodriguez C, Heath CW. Body-mass index and mortality in a prospective cohort of US adults. New Engl J Med 1999; 341(15):1097-105. Birmingham CL, Muller JL, Palepu A, Spinelli JJ, Anis AH. The cost of obesity in Canada. CMAJ 1999;160(4):483-8. Flegal KM, Carroll MD, Kuczmarski RJ, Johnson CL. Overweight and obesity in the United States: prevalence and trends, 1960–1994. Int J Obes Relat Metab Disord 1998;22(1):39-47. Cairney J, Wade TJ. Correlates of body weight in the 1994 National Population Health Survey. Int J Obes Relat Metab Disord 1998;22(6):584-91. French SA, Story M, Jeffery RW. Environmental influences on eating and physical activity. Annu Rev Public Health 2001;22;309-35. Canada's food guide to healthy eating for people four years and over. Ottawa: Health Canada; 1997. Available: www.hc-sc.gc.ca/hppb/nutrition/pube/foodguid/index.html (accessed 2002 January 31). Schoeller DA, Ravussin E, Schutz Y, Acheson KJ, Baertschi P, Jequier E. Energy expenditure by doubly labeled water: validation in humans and proposed calculation. Am J Physiol 1986;250(5 Pt 2):R823-30. Roberts SB, Dietz W, Sharp T, Dallal GE, Hill JO. Multiple laboratory comparison of the doubly labeled water technique. Obes Res 1995;3(Suppl 1):3-13. Martin LJ, Su W, Jones PJ, Lockwood GA, Tritchler DL, Boyd NF. Comparison of energy intakes determined by food records and doubly labeled water in women participating in a dietary-intervention trial. Am J Clin Nutr 1996; 63(4):483-90. Jones PJ, Winthrop AL, Schoeller DA, Filler RM, Swyer PR, Smith J, et al. Validation of doubly labeled water for measuring energy expenditure in infants. Pediatr Res 1987;21(3):242-6. Black AE. Physical activity levels from a meta-analysis of doubly labeled water studies for validating energy intake as measured by dietary assessment. Nutr Rev 1996;54(6):170-4. Goran MI, Poehlman ET. Total energy expenditure and energy requirements in healthy elderly persons. Metabolism 1992;41(7):744-53. Prentice AM, Black AE, Coward WA, Davies HL, Goldberg GR, Murgatroyd PR, et al. High levels of energy expenditure in obese women. Br Med J (Clin Res Ed) 1986;292(6526):983-7. Pannemans DL, Westerterp KR. Estimation of energy intake to feed subjects at energy balance as verified with doubly labelled water: a study in the elderly. Eur J Clin Nutr 1993;47(7):490-6. Bingham SA, Cassidy A, Cole TJ, Welch A, Runswick SA, Black AE, et al. Validation of weighed records and other methods of dietary assessment using the 24h urine nitrogen technique and other biological markers. Br J Nutr 1995;73(4):531-50. Schoeller DA. How accurate is self-reported dietary energy intake? Nutr Rev 1990;48(10):373-9. Johnson RK, Goran MI, Poehlman ET. Correlates of over- and underreporting of energy intake in healthy older men and women. Am J Clin Nutr 1994; 59 (6):1286-90. Rothenberg E, Bosaeus I, Lernfelt B, Landahl S, Steen B. Energy intake and expenditure: validation of a diet history by heart rate monitoring, activity diary and doubly labeled water. Eur J Clin Nutr 1998;52(11):832-8. Kaczkowski CH, Jones PJ, Feng JY, Bayley HS. Four-day multimedia diet records underestimate energy needs in middle aged and elderly women as determined by doubly-labeled water. J Nutr 2000;130(4):802-5. Mertz W, Tsui JC, Judd JT, Reiser S, Hallfrisch J, Morris ER, et al. What are people really eating? The relation between energy intake derived from estimated diet records and intake determined to maintain body weight. Am J Clin Nutr 1991;54:291-5. Jones PJ, Martin LJ, Su W, Boyd NF. Canadian recommended nutrient intakes underestimate true energy requirements in middle-aged women. Can J Public Health 1997;88(5):314-9. Kaczkowski CH, Jones PJ, Feng JY, Bayley HS. Canadian recommendations underestimate energy needs of women over fifty years as determined by doubly-labelled water. Can J Physiol Pharmacol 2000;78(8):631-5. Vinken AG, Bathalon GP, Sawaya AL, Dallal GE, Tucker KL, Roberts SB. Equations for predicting the energy requirements of healthy adults aged 18-81 y. Am J Clin Nutr 1999;69(5):920-6. Starling RD, Toth MJ, Carpenter WH, Matthews DE, Poehlman ET. Energy requirements and physical activity in free-living older women and men: a doubly labeled water study. J Appl Physiol 1998;85(3):1063-9. You are going to email the following Clinical nutrition: 5. How much should Canadians eat?